Alassio on the Beach Resort is located at the Northern end of Palm Cove just opposite the beach. This part of Palm Cove is exceptionally convenient to all of your holiday needs. Alassio on the Beach Resort offers a selection of self-contained holiday apartments, right on the beach front, built around ancient melaleuca trees, coconut palms and a lagoon pool. Mediterranean style balconies overlook the pool and Palm Cove beach. 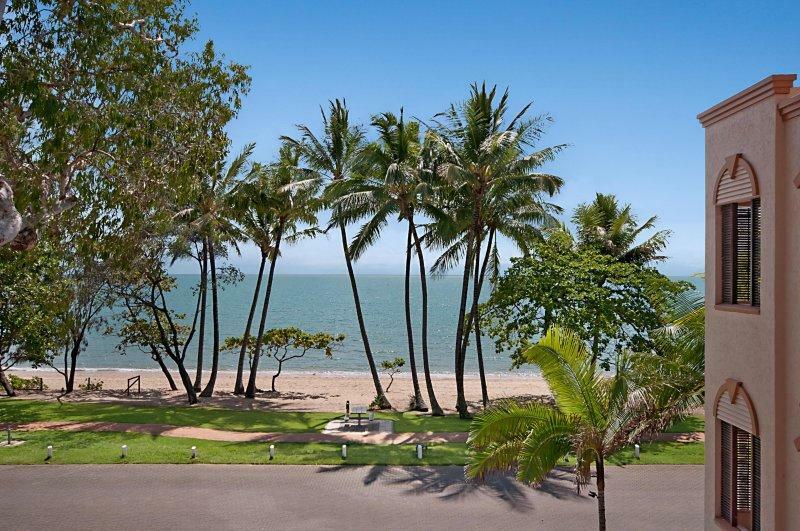 This Palm Cove accommodation is within five minutes walk of golf, the beach swimming enclosure, cafes, restaurants and bars and Palm Cove village shops. And of course, the beach and the beach foreshore are right on your doorstep. Enjoy a barbecue around the pool on site, or use one of the barbecues right on the beachfront under the coconut palms. Alassio on the Beach Resort is the ideal place to explore all that Palm Cove & North Queensland have to offer. Alassio on the Beach has Studio and 1, 2 & 3 bedroom self contained apartments that are located right on the Palm Cove beachfront. The palm shaded mediterranean style balconies overlook the pool or Palm Cove Beach, and some have views to glorious Double Island. Studio Pool/Garden: Ideal for short stays with no cooking facilities, these Studio's overlook the gardens or salt water lagoon. Bedding is 1 King Bed OR 2 Single Beds. Maximum room capacity is 2 Adults & Children. Studio Beachfront: Ideal for short stays with no cooking facilities, these Studio's enjoy views of the Coral Sea and Melaleuca trees. overlook the gardens or salt water lagoon. Bedding is 1 King Bed OR 2 Single Beds. Maximum room capacity is 2 Adults & Children. 1 Bedroom Pool-Garden: Overlook the lush tropical gardens or pool area, features a private spa on the balcony. Bedding is 1 King Bed. Maximum room capacity is 3 Adults & Children. 1 Bedroom Beachfront: Offers stunning ocean views and boasts a private spa on the balcony. Bedding is 1 King Bed. Maximum room capacity is 3 Adults & Children. 2 Bedroom Pool-Garden: Combination of a Studio and a 1 Bedroom Apartment with pool or garden views and private spa on the balcony. Bedding is 2 King Beds OR 1 King Bed + 2 Single Beds. Maximum room capacity is 5 Adults & Children. 2 Bedroom Beachfront: Combination of a Studio and a 1 Bedroom Apartment with ocean views with private spa on the balcony. Bedding is 2 King Beds OR 1 King Bed + 2 Single Beds. Maximum room capacity is 5 Adults & Children. 3 Bedroom Pool-Garden: A combination of two Studio Rooms and a One Bedroom Apartment, pool or garden views and features a private spa bath on the balcony. Bedding is 3 King Beds OR 2 King Bed + 2 Single Beds OR 1 King Bed + 4 Single Beds. Maximum room capacity is 7 Adults & Children. Alassio Palm Cove is within 5 minutes walk of Palm Cove's great shopping, bistros, restaurants and bars. 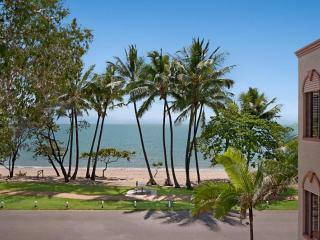 Palm Cove has a wide variety of dining venues - everything from small beachfront cafes to 5 star a la carte dining. Visitors to Palm Cove can experience that special holiday treat of dining alfresco under the stars or during the day, sit entranced while enjoying the beautiful views of Palm Cove's beach. Guests of Alassio Palm Cove can also self-cater with all apartments featuring full kitchenettes (no oven). Children: 2 years and under are free of charge. Children 3 years and over are charged at the extra person rate. Cots are available at an additional charge payable direct to the property.